Every Fire Pit San Diego Style is built to order. We do not stock Fire Pit Tables. There are no Fire Pit Tables setting in our warehouse. Every Custom Fire Pit San Diego Style Table, Fire Feature or Fire Pit Entertainment Center is built from the ground up upon order. Strong 1″ X 1″ and 1″ X 2″ 13 Gauge High Grade Steel Tubing Frames that won’t bend or warp. Fully welded joints that won’t break. Before assembly our steel Fire Pit Frames are put through a rust-proof coating process to insure rust is never a problem. Walls are made of HardiBacker® Cement Board with many tile and stucco options to choose from to match or compliment the decor of your outdoor living space. Where will your new Fire Pit Table sit in your backyard or patio? Have you measured the space available? Ultimately is completely up to you – Height, Width and Length will depend on numerous factors so you’ll be combining your ideas with the experience of our design engineer. Rectangle, Square, Round, Octagon, Hexagon or some other shape. The maximum number of people you wish to seat or stand around your Fire Table may be a determining factor regarding shape. Will you want to choose from the myriad of tile styles and colors we have available or opt for a stone counter top? Will you want stucco siding or stone veneer siding? Our design engineer has years of experience helping our custom made fire table customers through the things to consider above and more. 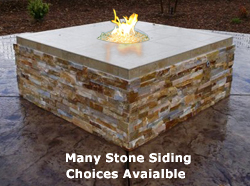 His job is to help guide you through the process of choosing wisely to end up with exactly what you dreamed of so we can deliver and install a Fire Pit San Diego Style Fire Table you will be able to join for years to come. Pricing: Ultimately the final price will depend on the shape, size and materials you choose for your Fire Pit Table – to give you a general idea of pricing . . .